Internet streaming and horror make a great pair. Over the last week, many interested horror fans received invitations to AMC's Shudder, a new internet streaming service exclusively for horror movies. The service is currently in beta, with a free 60 day trial. The service will then cost $4.99/month or $4.16/month with a 12 month subscription. As of now the service is only available via desktop, but will soon have apps for Apple, Android, and Roku. First impressions: The design is absolutely stunning. On the front page are featured collections, new releases, and staff picks. Account navigation is simple, and if questions arise, FAQs can be found at the bottom of every page, accompanied by a creepy house vignette with a rotating horror quote. The collections tab is my favorite Shudder feature. Here you'll find categories of horror movies broken down from slashers to creature features, perfect for locating the right flick for your mood. The only thing I thought was a little strange about the collections was that the images don't match up with the movies inside. 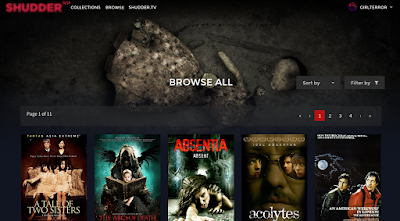 For instance, the "Haunted Habitations" collection features an image of Elizabeth Olsen in the Silent House remake, however the Silent House remake is nowhere to be found on Shudder, "Slashics," (featuring an image of Michael Myers, but no Halloween films,) and "Gross Anatomy," (featuring an image from Contracted, but no Contracted anywhere on the site.) It's a little misleading, but it could be attributed to the fact that the site is in beta and may not have all of the movies online yet. Time will tell. 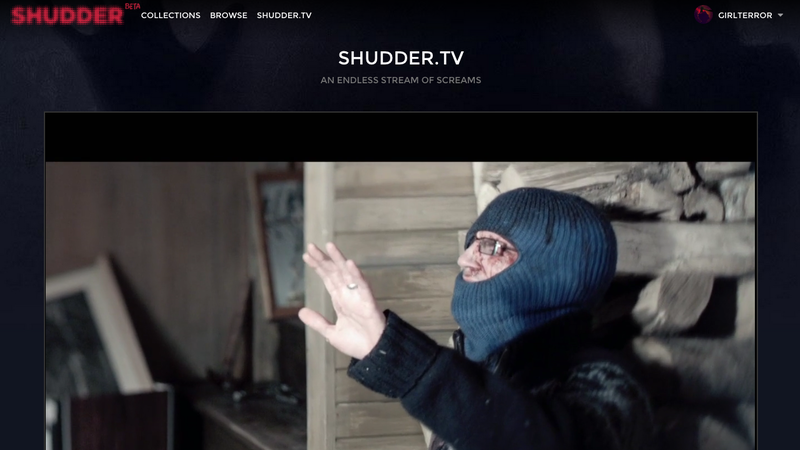 Last but not least, Shudder features a great new service with Shudder.TV, a 24/7 random horror stream. I'm really excited about Shudder.TV and hope to be able to check out some movies I wouldn't normally watch. The only downside is that nowhere on the website does it list what movie is playing. I reached out to Shudder and suggested they use a Twitter account to announce what is playing and when. They replied that they have a couple of other programming features in mind. All in all, I am so thrilled about Shudder and can't wait to see what else is in store. Did you guys receive your beta invitations? Tell me your thoughts below.